Federal, state and local government officials make budget and policy decisions that help or hurt local efforts to address housing insecurity. Through their approval of program staffing and funds, they can help people avoid homelessness or move them out of insecure housing situations. How important is community support to that decision making? How does an ordinary citizen stay informed about key policy and budget issues? How can individuals make a difference? 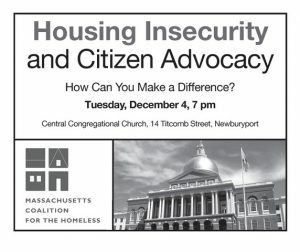 Hear from Kelly Turley, who leads advocacy work for the Massachusetts Coalition for the Homeless, and Ed Cameron, whose career has focused on addressing housing insecurity and currently serves on a local zoning board. Find out what you can do to find local solutions. This free educational session, presented by Pennies for Poverty and the Housing Opportunities through Partnerships and Education (HOPE) group, will be held at 7 pm on Tuesday, December 4th, at Central Congregational Church, 14 Titcomb Street, Newburyport.